Teenage Mutant Ninja Turtles is an upcoming American action comedy film based on the franchise of the same name. 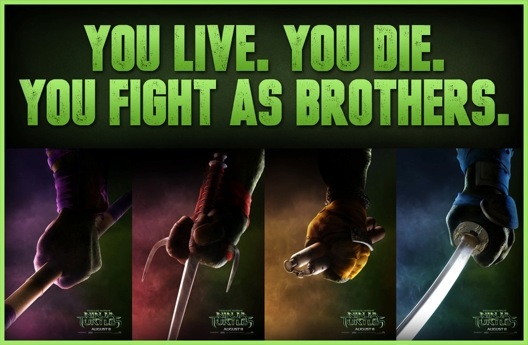 A reboot of the Teenage Mutant Ninja Turtles film series, the film is directed by Jonathan Liebesman and stars Megan Fox, Johnny Knoxville, Pete Ploszek, Noel Fisher, Jeremy Howard, Alan Ritchson, Danny Woodburn, Tony Shalhoub, William Fichtner, and Will Arnett. The film was announced shortly before Teenage Mutant Ninja Turtles co-creator Peter Laird sold the rights to the franchise to Nickelodeon in 2009. It is to be produced by Nickelodeon Movies and Michael Bay's production company Platinum Dunes, and distributed by Paramount Pictures. The film is scheduled to be released on August 8, 2014.